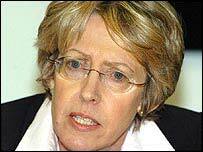 Health Secretary Patricia Hewitt believes smoking will eventually be completely banned in England. The government is consulting on a ban in public places by 2008, but pubs which do not serve food will be exempt. Ms Hewitt told the British Medical Association conference in Manchester pressure to ban smoking outright in pubs could become irresistible. However, despite pressure from doctors she failed explicitly to commit the government to a total ban. Ms Hewitt is the first health secretary to address the conference. She told doctors that consultations had shown that the public wanted to enjoy a "cigarette with a pint". But she said attitudes could well change as the ban gets put in place - and public pressure for a full ban would grow. "It is probably only a matter of time before we get to the same position as Scotland and Ireland." Doctors at the conference pushed Ms Hewitt for the government to impose an outright ban as soon as possible. But BMA chairman Mr James Johnson welcomed Ms Hewitt's comments. He said they amounted to strongest hint possible that the government would eventually ban smoking. Charmaine Griffiths, of the British Heart Foundation, said a total ban was required as soon as possible. "With 30 non-smokers estimated to die every day as a result of secondhand smoke, this is akin to fiddling while Rome burns." Ms Hewitt also announced the ban on NHS consultants working for independent sector treatment centres would be lifted. The ban was originally put in place to ensure the centres, which treat minor injuries, did not just shift staff from NHS hospitals. But Ms Hewitt said she was changing the rule - except for specialists where there are shortages such as radiography. Doctors have long complained it did not make sense because they could work in private hospitals. Mr Johnson said: "The ban did not make sense, but it does not change many of objections to the centres. Doctor training could still suffer."